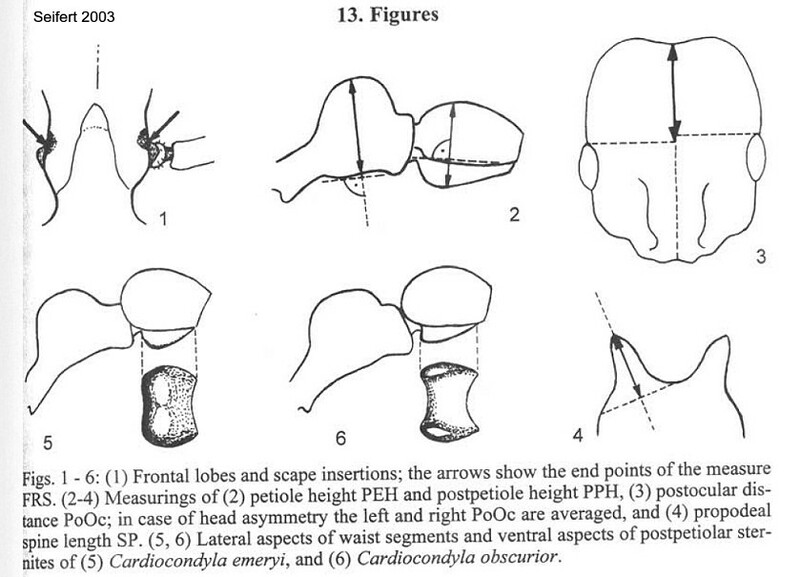 Diagnostic Features - Eyes well developed and sited forward of the front of the midlength of the head. Antennae 12-segmented, with a three-segmented club, and the scapes short, failing to reach the posterior margin of the head. The lateral portions of the clypeus project forwards over the basal margins of the mandibles. Sculpture usually of fine dense puncturation on the head and alitrunk, but none on the gaster. Sparse pubescence but erect setae only on the anterior clypeal margin. Alitrunk with the promesonotal suture absent and the metanotal groove impressed. Propodeum with a pair of teeth or spines. Petiole with a long peduncle in front; in dorsal view the post-petiole is very broad. Middle and hind tibiae without spurs. Bolton, B. 1982. 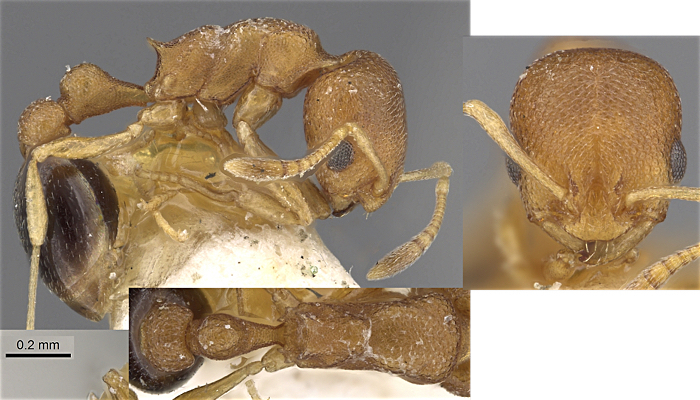 Afrotropical species of the myrmicine ant genera Cardiocondyla, Leptothorax, Melissotarsus, Messor and Cataulacus (Formicidae). Bull. Brit. Mus. (Nat. Hist.) Entomol. 45: 307-370. - elegans and nuda not imcluded. Emery's (1869b) genus definition is at . Arnold (1916) gave a genus description, this is at . Forel (1903a) gave a key to species from the Indian subcontinent; this includes emeryi, nuda and wroughtoni and is at (parvinoda is from India); Bernard (1956) revised the palaearctic species. Seifert (2003) reviewed the Holarctic and tramp species in a very detailed and sophisticated study. The list of species known from Egypt changed with the addition of a new species, C. israelica, elevation of C. nuda var fajumensis to species, with synonymy of C. emery var schatzmayri and C. nilotica (from southern Sudan); and addition of C. nigra due to synonymisation of C . elegans var torretassoi. Seifert, however, did not refer to the work of Schembri & Collingwood (1981) nor to Agosti & Collingwood (1987a). Key to workers - derived from Finzi (1936) and Bernard (1956c) - see also the key adapted from Seifert (2003) below.
. Postpetiole in dorsal view heart-shaped . Note - wroughtonii and sahlbergi are not given as from Egypt and, emeryi ssp chlorotica is regarded as incertae sedis (probably a synonym of wroughtoni or obscurior).